Sadly, Tom Thievin succumbed to stomach cancer in 2007. His brilliant efforts at gathering our Côté history live on in this article. I have but one regret: I think my father would have been fascinated by this information. It is completely possible that some of his buddies in the RCAF Alouette Squadron in World War II were distant cousins, and he would never have known. Alas, things have changed. A few years ago a handful of people shared information openly and freely. A loose network of relatives, old papers, and non-related historians worked in a friendly way to solve many genealogical and historical riddles. When someone suggested a date that another thought was incorrect, a friendly discussion ensued: "Say, Joe, if such-and-such happened on such-and-such date over here, then this date would have to be after that. What do you think?" It was friendly, and free, and fun. But nowadays people are selling information, correct or otherwise, thinking that if they discover something, they should be financially rewarded. Some outright bash others if they think something is incorrect. Some get upset because they feel they should get credit for information they think they alone discovered, even when sometimes their 'discovery' is the worst-kept secret in town. I got this. It's been in the family attic for years and I'd hate to see it lost. If this interests you, it's yours." In a friendlier world, I think people would understand that. Now I hesitate to use names in credits simply because I don't want their good intentions subjected to ridicule and bashing over inconsequentials. I don't know how many Jeans, Abrahams, and Annes are going to turn up over the next few years. My hope is that friendly and free information will be exchanged and that the 'fun' part of this will continue. And please, if you read something here that you know to be incorrect, email me before you do a slash, bash, and burn on a message board. I'm not trying to spread my doctrine or theory of life. I am trying to report the story and its associated historical aspects as accurately as I can. I have one last rant: Please do not email me if you have 'discovered' a Côté shield, badge, medal, or banner on the internet or elsewhere. My morals do not allow me to participate in something that some businesses at fairs and malls seem to have no problem with, and that is the practice of selling shield patterns and family-name histories prevalent in English culture. These businesses might make you feel warm and cosy about family honour, bravery, and whatever else. But there is enough information available to show that for French peasants, these items did not exist. I'll happily change my stand if there is real proof otherwise. Many thanks to all who have supplied information, historical and genealogical, including criticisms. It's all appreciated. Your interest in the Côté story will go a long way toward helping others if we can keep our search friendly, free, and fun. This article is a survey of our Côté genealogy. There are as a conservative estimate about 50,000 — perhaps even as many as 100,000 — Côtés or persons in North America linked to the bloodline, and most, if not all of them have Jean Côté, who arrived in North America in 1634, as their original ancestor. In all of French Canada, only the Trembley family is larger. My work was simplified by the quests of many other Côté researchers who preceded me in exploring the rich history that is the subject here. Since Côtés are so interleaved with early Canada and Québec, some history, or perhaps my version of it, is proffered to better state the facts. I could only skim the surface of this complex heritage. But there's much more to consider, and I invite you to delve deeper. Lastly, a note on the finality of information that follows: My research came primarily from the internet and from sources available in Alberta, so the work is not exhaustive. If you study church records in the Lotbiniere municipality in Québec or look up military records, French naval records, and other documents from the 1600s, you'll immediately expand on my work. These sources weren't available to me. While there was every attempt to ensure accuracy, history will probably indicate some errors in what I've reported below. The direct French translation of côté is "side". The French translation of côte (without the grave on the e) is "coast" — not altogether different in meaning from "side". In an interesting linguistic similarity, the latin costa also means "coast", as in Costa Rica, meaning "rich coast". ... at http://web.ionsys.com/~microart/jean.htm clearly shows his name as Jean Coste. Like many French Canadian family names, it appears two basic spellings exist; one an Old World spelling, Coste, and the other a New World spelling, Côté. Like most other Côté researchers, I've used the spelling Côté throughout. This was an arbitrary choice since there are actually many spellings. Côté was chosen simply because it was more frequently used by the family after the first generation. Lending to the chaos was the French Canadian use of 'dit' or 'nick' names. The dit name was actually more, sometimes a lot more, than a nickname. Often the dit name was the more common name and was substituted on legal documents and other records without much regard for spelling. For example, when soldiers of that era joined the militia, they were induced into their regiment with a hazing and usually given a 'dit' that often had no cognitive meaning. Often the dit name stuck and occasionally became the family name. In the case of Jean Côté, it appears he was known as "Jean Côté, dit Costé". The latter name appears to be the one most used by generations before Jean and by the first generation, that is, Jean's children. There is evidence that the name Cottez was also used. Sometimes too, Jean is spelled Jehan. When translations from other languages are used, all phonetic possibilities have to be considered. This is interesting in that as a typical French farm labourer and peasant of that time, it's highly improbable that Jean Côté was educated or knew how to read or write. The signature mentioned above might well have been made on his behalf and with his acknowledgment. At best, it might have been the only thing he could write. The exact spelling was probably not important for the time and status of those involved. Other names that appear in various records that refer to members of this family lineage are Coté, Côte, Cote, Cotoe, Couty, Cotey, Caudy, Cauta, Caute, Cete, Costey, Costez, Costé, Cota, Cotta, Cotte, Cottez, Coty, Gaudy, Lefrise, Side and Sides. (Remember that Côté translates as "side" in English). Research suggests that Cody and Cole belong on the list, but since they are also common English names, sorting them from the French could be an impossible challenge. Certainly the earliest property records in Québec suggest that the name Costé was more common in the first generations. Careful choice of names was applied more among the landowning upper class and for legal documents of the middle class. If the research from France stands, Jean Côté was from the working peasant class and not a landowner in Europe, so it's also unlikely that this spelling is consistent in Europe. For that reason and because little information has been found to indicate service in the military, it's also unlikely that a family crest or shield was commissioned, although one appears at one Côté site on the internet. Finally, there's a discussion site on the internet where some Côtés have reported various pronunciations of their name. These include "Coat" as in goat, "Cotay" as in no way, "Cotee" as in goatee, and so on. This is significant since it defines the reason we're here at all. An Italian, Giovanni Caboto (sailing for England as John Cabot) claimed Newfoundland for England in 1497, and this led to exploitation of the Grand Banks fish stocks off the east coast. Then in the 1530s, the Jacques Cartier explorations claimed the St. Lawrence River and the present Maritimes area for France. Both Natives and Europeans recognized that fur trade was possible, and so trading began, something that the Natives regarded as common, for things the Europeans had: tools, metal wares, and later, guns and alcohol. But back to the history: A French commoner, Samuel de Champlain, became an expert in exploration and cartography and was convinced that the area had great potential. To that end, he set out to get commercial and governmental sponsorship, to inhabit the area with French people, and to begin land surveys. His first fort, Port Royal in Nova Scotia, failed due to severe winters and a lack of farming and survival skills needed by the new French inhabitants. For many the adventure ended in starvation. An interesting thought: The Pacific weather disturbance now known as El Niño occurred in those years and may well have played a role in the unusually cold and long winters. After piquing the interest of a commercial group in France, Champlain began work on his second and most lasting colony called Québec or Kebec, which was the Native word for the place where the St. Lawrence River narrows. Champlain's work in New France, mapping and setting up treaties with the native aboriginals, organizing settlers, and generating interest and sponsorship of the colony in Old France probably made him the best ambassador Canada has ever had. He also learned the various aboriginal tribal political systems and created many alliances and trading agreements whose importance was realized only years later, often at great cost. 1628 - Half the population of Lyons dies due to the Black Plague. ** See Marriage Relationships in Tudor Political Drama by Michael A. Winkelman or simply Google this for more information. Later in the 1620s, Dr. Robert Giffard from Mortagne in the Province of Perche in France visited and became interested in the area. In 1627 fewer than a hundred Europeans lived at Québec. (Unless otherwise stated, "Québec" alone means Québec City.) That year the 'Compangie des Cent-Associés' was created to capitalize on the growing fur trade and colonize and manage the area. In essence, Québec became the property of this company. In 1628 the company sent 400 settlers, but they were met at the mouth of the St. Lawrence by the Kirkes brothers who had claimed the area for England. The Kirkes blockaded the St. Lawrence, sacked Québec, and shipped settlers home until 1632 when the Treaty of Saint-Germain-en-Laye returned the area to France. In early 1633 there remained six families and five aboriginal translators living in what was now dubbed "New France". The first problem was attracting settlers to live somewhere with little hope of making a profit and a climate far colder than France. Recruiting fur traders was relatively easy, but farmers were another matter. France, even northern France, had a warmer climate and a longer growing season. Farming without crops that could endure this climate was a challenge. France also had a well-entrenched class system, essentially a feudal state, and landowners, the upper class and the nobility, had little-to-no interest in relocating to New France. Black flies and cold winters were enough to keep anyone with privilege or entitlement well away. For them it was preferable to risk the Black Plague then making its way through Europe. Added to this were reports of Indian hostility, so recruiting farmers and labourers who might relocate to this inhospitable land would be very difficult. The initial proposal by Cardinal Richelieu, agreed to by the king of France, was to grant rights to full exploitation of the area to the Compangie des Cent-Associés. This company realized that unless the area was settled, there was little hope to profit over the long term, and so they allowed the granting of land parcels to those who could clear and develop them. And so started the seigneurity based on the fiefdoms common in France, a culture understood by both those granted land and those who agreed to work to clear it. See www.cam.org/~qfhs/FAQ_land.html. Based on the medieval practice of 'no land without its lord', the plan intended to make Québec and New France hospitable or at least suited to habitation. In Québec this was just a narrow strip of land touching the river's edge and inland several miles. Entrepreneurs would develop parcels by employing peasants as labourers. The lord of the seigneurity was the seigneur (French for 'lord') who had absolute control over his domain, including matters of education, policing, medical, marriage, and food and shelter for his labourers. He built and maintained flour mills and other required public buildings. Most seigneurs drafted tenuous legal contracts that, when read between the lines, favoured themselves. For his investment, a seigneur collected rent and whatever else he could extract from his tenants. All of this was supposedly done as homage for the king and God. In the end, labourers who survived the ordeal would have the blood of some of the most determined and hardy people to have visited any part of this planet. Those who failed returned to France with little. That is, if disease, the Indians, or some accident didn't kill them first. It should surprise no one that most seigneurs were motivated more by greed than reverence. And since most early settlements were not very successful, they found themselves doing all they could to keep their tenants. There would be many verbal agreements, land and animal swaps, legal entanglements, and law suits. Many French Canadian families tell this story. The French navy had a regulation that required that every ship have a doctor on board, and as a result, a Dr. Robert Giffard arrived in New France with the first wave of French migrants. He visited the old settlement at Port Royal and at Québec, and he was among those sent back to France by the English Kirkes. He was, however, quite impressed with the area, and when the Company of a Hundred Associates came calling in 1633, he returned to New France to create a seigneurity. Like any seigneur, Giffard needed farm workers. These he recruited from his home region, Mortagne and Tourouvre in Perche. He already knew what it would be like and what kind of people were needed. His settlers would have never experienced severe winters, hostile aboriginals, isolation, near starvation, back-breaking work, wilderness, and billions of black flies. They must not only survive all of that, but they would need to grow in number, prosper, and create a new home and country if Giffard's aspirations were to bear fruit. From the Perche area of Normandy, Jean Côté, dit Costé accepted an offer by a man now considered to be the first seigneur in Québec: Robert Giffard. While the legal document that would bind Côté to his seigneur hasn't been found, we presume that it stipulated that he work for Giffard for a period in exchange for his passage. The contractual duration is also unknown, but agreements of that era usually stated five years after which a cow or other livestock, some land, or whatever else, was awarded to the labourer. Côté was among the first Normans recruited, along with Jean Guyon, Marin and Gaspard Boucher, Sébastien Dodier, Zacharie Cloutier, Pierre Paradis, and Pierre Maheu, Guillaume Isabel, the Desportes family and a few others. Generally, seigneurs knew that to have permanent settlers, they must attract families or tenants who would start families. Jean Côté, being single, was perhaps not an ideal candidate, but he likely had desire and a durability that interested Giffard. Many more Normans would arrive later. There are now very good historical information websites developing such as www.dfait-maeci.gc.ca/paris/canadafrance/percheemigration-e.asp. This one nicely explains Dr. Giffard's exploits. Our ancestral beginnings in "New France"
As previously mentioned, life in the old country in the 1600s was difficult, especially for peasant classes. A peasant was essentially devoid of rights. A peasant who wanted a better life could try to obtain a cow, a pig, or some chickens. It was possible to do this by careful trading, and eventually he might gain status, possibly even some land. But the chance was very small. Even if an animal was acquired, the army might pass through and take it. And there were taxes. Peasants, owning very little, had few taxes to pay, but any tax for those with little or no income was an extreme hardship. France in the 1600s had no sewer systems, and the filth of animal and human wastes and consequent threat of disease was everywhere. While finding suitable recruits for the New World might have been difficult, it was probably easy to fill boats with French peasants looking for a better life, especially if a cow or some other asset was part of the promise. Our Côté ancestry began in New France with Jean's contract with Seigneur Giffard, a woman named Anne Martin, and a free voyage. Jean landed at Beauport (see Appendix 1 below), now a subdivision of Québec City, to begin a new life. A website at www.genealogie.org/famille/belanger/FrancoisImmigrant.html provides insight to the Québec community and other aspects of life at that time. Guesses could be based on what is known about the ships of those days and prevailing circumstances. If the television show A Scattering of Seeds - The Creation of Canada is of interest, its website at www.whitepinepictures.com/seeds is worth a visit. Another site at www.geocities.com/Heartland/Ranch/6210/01_navires_pre_1666/E1navires.html states the number of ships and their captains for those early years. Window glass was not generally available until a process was developed in France in 1688. Homes of those days had no windows, and if building ideas from the old country were employed, most homes would have only had openings covered with an oiled, translucent paper that could be shuttered in the winter. The movie Blackrobe, directed by John Lantos, written by Brian Moore, is set in Québec in 1634. While it's mainly about the spirituality of the Jesuits and the Natives, it also portrays many aspects of life in that area at that time. The roles of workers, the clergy, and even Champlain seem carefully considered and portrayed. The window used by Champlain appears to be oiled paper, which would have been correct for the time. Heartland/Ranch/6210/ which is the home page of the site above contains good data and links. (Yes, I have noticed that the plaque on the memorial to Louis Hebert states that Jean Côté arrived in 1635.) The search engine at this site links to the www.ancestry.com site, and this might be useful to US-based Côtés. There are also considerable errors here. But given that this site is hosted by an American-based protestant church, it's likely that our Jean, who was a faithful and loyal Roman Catholic who paid homage to his seigneur and to his God, wouldn't really care. It appears that in 1633 the dozen or so people at Québec saw their numbers increase to a couple hundred with arrival of three or more ships. In 1634, if the information in Appendix 1 is correct, Jean sailed on a ship that was part of a flotilla, of sorts, of five or six ships. His vessel could well have carried 75 souls comprised of families, soldiers, and missionaries and basic tools, supplies, and animals for farming and articles for fur trading. Most sailings were in summer months, and their arrival in Québec would have significantly boosted the population to 500 or more. Vessels would have then collected furs for the return voyage. Generally ships of that era were supplied by the French navy, which is why searches at the French naval archives might be fruitful. Appendix 2 below contains information from Jean-Guy Côté. It's definitely interesting, however, questions arise. One is that it's in English and it might have suffered in the translation. Another is that it refers to the Côté spelling, and this might not have been the name Jean and his predecessors used. Another problem is that there aren't yet any links to the persons indicated. Still, the information shouldn't be ignored since it could disprove some of our thinking. "It is most likely that (Jean Côté) came from Perche, but he is one of the rare settlers about whom tireless researchers, such as Pierre Montagne and his wife, have discovered nothing in the archives of this French province. Without a doubt, it is for this reason that they do not mention him in the Percheron Cahiers, nor in Tourouvre et les Juchereau." I have found the essence of this paragraph in several sources on the internet. There is also a good chance that Côté came from the Dieppe area. Information is surfacing to suggest Coste namesakes were involved in the fishing junkets to the Grand Banks. Jean Côté's peasant background, marital status at the time of his departure from France, and apparent absence of military service certainly gives rise to another more sinister speculation: that he was on the lam. I believe it would be wrong to discount this possibility, and it creates yet another fascinating wrinkle in the mystery behind this intriguing man whose genes are now replete in tens of thousands of North Americans. It's doubtful that this was the grandmother's true family name. Since Côté also means "side", she simply may have been "at the side" of Galleran according to nomenclature in ancient cultures. Galleran was devoted to the cause of Mary Queen of Scots, but it's unknown whether he was a Scot living in France or a Frenchman spending time in Scotland. Currently it's believed that Galleran and Isabella were from Scotland. Galleran was involved in a plot to free Queen Mary from the English. The plot failed. History knows well that Mary was beheaded. Galleran fled to France with his family. Galleran's son, Abraham Martin, was born in Scotland in 1587. Abraham arrived in New France (Canada) on the sailboat LeSallemandie at Tadoussac on August 30, 1620. His wife was Marguerite Langlois, whose sister gave birth to the first European born in Canada. After the takeover of Québec by the Kirkes, Abraham was sent back to France with hundreds of others, as stated above. But in 1633 he returned to Québec with his family which now included a daughter named Anne. He worked as a river pilot, ploughman, and fisherman. Abraham is often noted as Abraham Martin dit l'Ecossais, meaning Abraham the Scot. But possibly there were two Anne Martins. One was a kid sister to Abraham, born about 1617; the other was Abraham's daughter, born on March 23, 1621. I raise this since either one could be the Anne Martin who ultimately married Jean Côté . Both were born in Perche Province in France. The assumption is that Abraham married Marguerite Langlois in France on Oct 24, 1621, leaving Anne to have been born before the marriage in both cases. Anne, Abraham's sister, was born in 1617 and would have been 28 years junior to Abraham. Her mother would have been about 50 at the time of her birth. She could have met Jean while in France and then travelled on one of several ships that arrived from France in 1635, and at the time she would have been about 18. She might also have arrived as a guest of her brother with a view to see what might develop with Jean. Anne, Abraham's daughter, was born in 1621 and would have been 15 at the time of her arrival from France and her marriage to Jean. While this is possibly more credible than the first scenario, it conflicts with data that suggests Abraham and Marguerite had another Anne born in 1645. I will hold to the notion that the Anne who married Jean Côté was Abraham's daughter, unless other data arises to the contrary. A message I received, possibly from Pierre Côté, indicates that records were lost in a fire, and the year 1640 comes to mind. If so, much critical information about Canada's first settlers will never be known. Logically, though it's not verified, Jean Côté and Anne Martin, based on the birth of their first child, were involved in a relationship by January or February 1635. The child, Louis, was born on October 25, 1635, and they were married a few weeks later by the missionary Jesuit Charles Lalemant on November 17, 1635 at Giffard's home, with Giffard being their witness and sponsor. Jean was a cultivateur meaning a farmer, farm labourer, or gardener. Since Giffard himself had nearly starved in this new climate a few years earlier, Côté and others like him were critical to the success of his seigneurity. Jean Côté worked as a fief or tenant, clearing land and farming for Giffard at Beauport. After probably five years, he was given an 'arpent', which is about an acre of land. He may have also received a cow, since this was a common payment for services. Champlain died a few months later at Christmas, and virtually the whole settlement at Québec attended his funeral. Doubtless, our Jean and his wife were there too. One only wonders what they and their fellow settlers were thinking. Surely they pondered their future since Champlain had been their guide, their protector, and their sponsor. He had arranged peace with the aboriginals and had battled tirelessly on both sides of the Atlantic for everything that Québec had become. This was a dreary and foreboding time at the settlement. Gradually it was evident that land seigneurities would never rival the great fortunes created from fur trading, and France's interest in colonization began to wane. It also became clear that the settlement had much more land than prospects for creating seigneurities. Those who came as peasant labourers realized that they too could have land, and it wasn't long before seigneurities were also granted to peasants and labourers as freely as they were to France's elite. Very likely all were born at their home in Beauport. For Jean's descendants at least, this was the first generation of Canadian born Côtés. Some of the information following is commonly known. Who actually "discovered" it is hard to determine. Some of it is also covered again in Appendix 1. A neighbour and relative of Jean's (the brother of his mother-in-law), pioneer Noël Langlois, owned 300 acres that Giffard ceded to him in his seigneury of Beauport in 1637, and in return for Jean and family living close by, Langlois provided some homestead land for Jean. In 1641, Langlois and Jean made a contract with the Company of New France for the supply of 500 bundles of hay at the price of 80 livres, the currency at the time. Jean built his house, and in 1645 Lord Giffard granted him ownership of the ground that he occupied; about three acres. This land became the subject of a dispute over theie verbal agreement. In the end, the act of generosity caused more problems than it solved. Jean Côté became the owner of a house situated near the present corner of the rue Trésor (Trésor Street) and the rue Baude (Baude Street) in modern Québec City. Today this is an alley where artists display their creations for tourists. The house was on a plot of land with 150 feet of frontage and 60 feet in depth. On 15 November 1649, Côté offered it as dowry for his eldest daughter Simone when she married Pierre Soumande. On 7 November 1655, Soumande sold this house to Jacques Boessel for 350 livres. Côté also owned a piece of land between la Grande-Allée and the river in what was then the outskirts of Québec. The act was ratified on 5 April 1639 for the land Governor Montmagny had given him on 27 August 1636. The practice of passing the homestead to the oldest male doesn't appear to have occurred in this case. Jean Noël was three when his older sister married Soumande, and apparently the boys all had to look elsewhere for their homestead. Just off Québec City in St. Lawrence River is a large island, about 21 by 5 miles in size. Even Jacques Cartier remarked at its beauty, eventually naming Ìsle d'Orleans after a friend. In 1651, the residents of this island were granted fiefs by the governor, and it became possible for commoners to take up land there. (Check www.lachances.net for a very nice website made by the Lachance family on this island.) Probably due to availability, all the Côté boys took up acreages there, and from there the Côté bloodline began its movement throughout North America. It's interesting that ancestors of ex-prime minister Jean Chretien, singer Celine Dion, and many other famous French Canadians also came from this island. There were essentially four nations of aboriginal peoples in the area. The Algonquin and the Montagnais were traders, peaceful and quite nomadic. Their territory was mostly north and northeast in the backwoods of modern Québec and Labrador. The Hurons were south and east in the area now known as the Eastern Townships. This is now cultivated Québec, Maine, and New Brunswick. They were somewhat agricultural, peaceful, and also nomadic. The Hurons were often attacked by bands within the various Iroquois nations and the Mi'cmaq, and a threat to Huron populations existed. By 1639 their numbers had been halved by European diseases and wars with other more aggressive aboriginals. There is interesting historical data at www.dickshovel.com/mic.html. In 1641 a priest working with the Hurons named Jean Brebeuf wrote The Huron Carol. Then in 1649 the Iroquois tortured and killed him and Lalement (not the one who performed the marriage ceremony for our Jean and Anne in 1635). This was a time when the probability of capture and harrassment or killing by the aboriginals was quite high, especially for those who were out of the range of safety of their homes. It's surprising that there wasn't a huge outcry or a large-scale retribution over Lalement's death. In 1660-61, the Iroquois were again at war throughout the area attacking Montreal and even pillaging Ìsle d'Orleans. These wars totally decimated the Hurons, and since fur trading depended largely on them as middlemen, it began to subside. Jean Côté died in Québec on March 27, 1661. According to Appendix 1, he is buried in the church at Notre Dame Church in Québec City, although this is disputed. In 1663, King Louis XIV made New France a crown colony with Québec becoming a royal province, and royal governors or intendants would replace private commercial interests in governing Québec. In 1660-70, black or bubonic plague was taking its toll in Austria, Italy, and southern France. In 1665, France sent Jean Talon, "the Great Intendant", to take over as head of the colony, and the first challenge he faced was to increase the population. In 1666, Canada's first census revealed a population of 3,215, and by 1672 it was 7,000. Since it was now formally a colony, the French crown paid for the passage of thousands of settlers, even disbanding the Carigan-Salières regiment and forcing them to stay. Proably the best accounting of the soldiers is at this website: Carignan-Salières Regiment Officers and Soldiers. The ratio of men to women was 6:1 in 1666, that is, about 2,800 males and just 400 females. France had sent the Carigan-Salières Regiment, a thousand or so soldiers, to protect its developing colony. During this time, the arrival of Filles de Roi (daughters of the king) became a famous historical event. Prompted by Talon, the king sent females to the colonies to promote marriage with soldiers and other marriageable males. Between 1663 and 1673, roughly 800 women from 12 to 40 years of age, some from orphanages, and others from poorer families in France's western provinces, were sent across the Atlantic. An excellent list of those who married is at www.prdh-igd.com/en/les-filles-du-roi. No fewer than 18 of our Côté ancestors were among the Filles du Roi  "daughters of the king" brought to Canada in the 1600s to boost Québec's population. Painting: "Arrival of the Filles du Roi at the Maison Saint-Gabriel" by David Mackie, depicting Sister Bourgeoys meeting some filles upon their landing. Despite rumours that they were poverty-stricken street people, in reality they had rudimentary educations and were required to qualify before they received a small dowry and passage to the new world. And despite unkind things that have been said about the integrity of the Filles du Roi, within a few months of their arrival, most had indeed married, and eventually nearly all married. While calling them the king's daughters might have added some dignity to the affair, in fact to Talon and to Québec, they might have been the king's crown jewels for the demographic benefit they brought to New France. If not immediately, these brave women would understand that their new lives came with serious demands — nursing, child-rearing, survival basics, and an important role in building the new frontier. Their contributions are still beyond measurement. It was not what the Filles du Roi were or what they possessed, but rather what they were not. They were not privileged ladies of the courts or from upper/middle class backgrounds. They intimately knew the realities of hardship, of hard work, and of being in a difficult environment. The dowries provided by the king injected valuable economic assistance at the family level. Their arrival and presence was exactly what Québec needed, and a baby boom of unprecedented proportion followed. In 10 years, by 1677, the population more than doubled. Fifteen years after Canada's first census, the genders were about even in number, and the Filles de Roi were as close to a perfect solution to a problem as there ever was in history. The bloodlines of our Filles du Roi are not unique to Canadians. Fast-forward a few centuries, and Hillary Clinton, Madonna, Angelina Jolie, and probably many others are among notable North Americans who claim ancestry from the brave Filles du Roi of Québec. Since their numbers amounted to over 10 per cent of the population, the bloodlines of the Filles du Roi quickly permeated the entire French Canadian population in the area. There are very few unfortunate French Canadians from the Québec era who aren't related to at least one Fille de Roi or soldier from the Carigan-Salières regiment. As mentioned in Appendix 1, one of Jean Côté's sons married a Fille de Roi. Hockey fans might be interested that Guy Lafleur and many other famous Canadian hockey players are descendants of the soldiers of the Carigan-Salières Regiment. Within a generation, Québec transgressed from a wilderness trading outpost to a somewhat decent, family-oriented society and culture. This marked the beginning of a major change in the makeup of French Europeans in Québec. From this period on, approximately a third were Normans from rural areas of France, and the rest were from the urban areas, split up such that half were the military and filles de roi, and the others were missionary, governmental, and administrative people. If the Filles de Roi event wasn't enough to elevate Talon's reputation, other aggressive steps to encourage population growth surely helped. In 1669 he issued a royal decree that stated that girls were to be married by age 16 and boys by age 20. Those who complied were given 20 livres. And to make sure parents were productive, they were given a pension of sorts of 300 livres per year for having 10 or more children (children who became priests or nuns didn't count! ), and those who had 12 or more got 400 livres annually. The birth rate rose to over four times that of today. With Talon's encouragement, a culture developed of early marriage, large families, and quick remarriage upon the death of a spouse. The birth rate, coupled with free passage to New France from Europe, sent numbers soaring, and thus it took little time to populate the land with the next generation. During this period, Ìsle d'Orleans quickly became completely inhabited. Each succeeding generation would have to look elsewhere for land. In 1670, Hudson's Bay Company was granted a charter from the king of England to trade fur in the Hudson's Bay area. This started another round of fur-trading wars and caused many skirmishes among traders, aboriginal middlemen, and trappers. In 1682 LaSalle explored the Mississippi to its mouth at present-day New Orleans. In 1689, the Iroquois killed many French settlers at Lachine. In time, the Native confrontations started to settle. Ìsle d'Orleans had become less dangerous, and all the sons of Jean Côté, Louis, Martin, Jean Baptist and Jean Noël took up land there to raise their families. Québec City now had a several thousand people and likely was not so desirable a place to live. Stench of human and animal wastes, rats, chimney smoke, and health problems known to all cities in those days made country living most attractive. The oldest Côté boy, Louis, died a young man. His children followed their mother to the Ìsle aux Coudres. There she was remarried to Guillaume Lemieux and settled eventually in Saint-Thomas de Montmagny, which gave rise to the Lemieux dynasty. (Thus it's quite possible that hockey legend Mario Lemieux has Côté blood.) Martin's sons spent their lives on the Ìsle d'Orléans and at Beauport while grandson Gabriel settled at Rimouski. It was this branch of Côtés that produced David Côté the explorer. Paying homage: Essentially, a peasant meeting with his seigneur would kneel, remove his hat and sword, and utter an appropriate oath of allegiance. It was soon clear that picking a day when the seigneur wasn't home was one way to avoid this belittling ritual. In New France the practice eventually became redundant and died out. New France and Québec were starting to take shape. A class structure had begun where educated people performed management, administrative, and pastoral work; the uneducated did everything else. The basic difference from other class structures was that resources here were from the working class. Peasants, educated or otherwise, realized that the situation in New France was entirely different from that of the old homeland for several reasons, perhaps the largest being that Old World system of paying homage and kow-towing to landholders was no longer part of life in this new land. In the New World, workers could survive without the help of a seigneur, since seigneurity needed them much more than they needed seigneurity. Not only did farm labourers find that much land was available to them, but that they were much freer than in the old country and could do whatever they wanted — including simply disappearing and possibly working with and for the aboriginals. No matter how lawless, uncivilized, and unlike Old France, there was always a way to survive and perhaps even improve their lives. For those who disliked the drudgery of farm work, it was always possible to work as an intermediary or broker to deal with Native traders. Opportunities could be better, sometimes much better, than working on a seigneurity. As a result, a seigneur's need to keep contented labourers was resolved by giving them land, or he simply found new settlers. Catholic missionaries also found themselves in a much different light than they'd expected. Priests of the old ilk were revered, so traditionally the church held a major influence in the life of a peasant labourer. Since priests were educated, they acted not only for pastoral issues, but as mediators, negotiators, lawyers, and counsellors, assuring that parish and church benefitted, and thus adding to their esteem within the church system. But the working class started to regard priests differently from the Old World model since a new set of values had arisen. Churches survived, but morality and religious values were taking interesting turns. Local priests realized that the basic French Canadian was highly principled and independent, while old Catholic icons in Europe began regarding French Canadians as somewhat immoral and spiritually decrepit. Varying turns of good seasons, crops, and other successes or failures left peasant labourers to ponder whether God was important to their survival after all. What perhaps seemed more important was hard work, integrity, and resourcefulness. The old system of total religious dedication and subservience to church and seigneur would never impact them as it had in France. A change was underway that some believe formed the cultural basis for New World thinking today. Still many argue that priests held considerable power and their influence, especially during elections, is still is an important element in modern-day Québec. Eventually, and perhaps inevitably, the old systems of seigneurity, paying homages, fiefdom, and complete subservience to the church and their masters lost out. Property ownership and self-destiny began to take root, and life for immigrants in New France steadily gained favour over life in the old country. While the hard life caused the return of many people to the old country, for the ancestors of what was to become French Canada, there was no turning back. For reasons unknown, this generation mostly used the name Coste and sometimes LeFrise. Surprisingly, children of this generation would revert to Côté. I was told by one researcher that the practice of choosing old-country French was common until the late 1700s. While it would literally spell confusion for modern-day researchers, the fact remains that these names meant the same thing. (Joseph and Augustin appear to have died on the same day. Accident?) All these children were born on Ìsle d'Orleans in various parish jurisdictions, Ste-Famille, St-Pierre, and St-Lament. During this time their grandmother Anne Martin died, specifically in 1684, in Beauport. Both she and her husband Jean were apparently buried in unmarked graves, although Appendix 1 states otherwise, and in fact their whereabouts are unknown today. "helene graton ages de 37 an famme de noil Cottez de La Parou?ge de St Pierre a Iille dorlean sorte le 12"
... which loosely means Helene Graton, aged 37, wife of Noël Côté? (note spellings) of (perhaps name of seigneurity) of St. Pierre of Ìsle de Orleans, departed on the 12th (of June). A map drawn by Catalogne and Couagne in 1709 at www2.biblinat.gouv.qc.ca/cargeo/htm/a40.htm shows that several Costés had land parcels on Ìsle d'Orleans. It also states that no more land is available, and thus the next generation moved on. Today a beautiful farm on the coast, 'the Coterie', property of Pierre-Célestin Côté located at number 6109 Royal Avenue, testifies to this. 1706 - Christofori invents the piano. the French from Hudson's Bay. Jacques Côté, from our branch, was the fourth boy. Assuming the homestead went to the oldest son, he likely had to look elsewhere to settle. He would have been among the first of the next group of settlers to choose the Eastern Townships. Madeline died in 1712, just six years into the marriage. His oldest child being six and the youngest barely a year old, Jacques remarried Therese Catherine Lambert Briene Vincenne. She had seven more children and died in 1730. Apparently not given to bachelorhood, he remarried yet again in his 46th year in 1732 to Genevieve Cauchon who bore him no additional children. Back in 1706 when Jacques was of age to start a family, his father had been dead for five years and his older brothers had probably taken over the family homestead. By 1712 all his older brothers had died, and yet Jacques did not take up the homestead on Ìsle d'Órleans. It's possible that this land was either assumed by his sister Louise or given as dowry. In 1713 the English took total and final control of Nova Scotia, then Acadia, as one of the settlement terms in the Treaty of Utrecht which ended the War of Spanish Succession. Wars had severely depleted France and left the colonies economically on their own. England's takeover of Nova Scotia meant that its inhabitants must pay homage to the England's royalty and convert to the Protestant Church of England. This caused a 40-year standoff that ended in 1754 when the governor of Nova Scotia deported anyone who would not pledge allegiance to the English Crown. At this point, North America was still considered a colony by both French and English. The French occupied an area extending from the mouth of the St. Lawrence to the mouth of the Mississippi and west to the Great Lakes. The English had taken over the American colonies of the east and the Hudson Bay and west area trading system. In 1754 a British general named George Washington decided to test the resolve of the French by attacking a fort on the Monogahela River near present-day Pittsburgh. Being short on troops and training, his attack didn't go well. The lesson he learned has stood the test of time. United States has never attacked the French since and have seldom considered a fight anywhere unless odds were greatly in their favour. Thus started the last period of fighting between Britain and France over French colonies in the New World. When Jean Charles Côté was born, his father Jacques was 59 years old, Josette was 45, and they had been married for 11 years. Interesting! George Washington's actions in 1754 signalled the start of the Seven Years War in Europe. Anyone falling asleep in 1754 and waking 25 years later would have had a huge surprise. The political layout of the world completely changed. In 1756 war broke out in Europe, and England used its superior sea power to cut New France off from Europe and later recapture Québec. In September of 1759, our branch of the Côtés and a few hundred other settlers could only watch as 1,200 British soldiers moved into their town of Ste-Antoine-de-Tilley and took over their church. British General Wolfe hoped that General Montcalm, who commanded the French army on the other side of the river, would attack. Montcalm did nothing and thought that since the cliffs that Québec sat on were said to be resistant to military attack, he could easily defend the city without a needless and costly attack on the river or on open land. What happened next of course is the stuff every Canadian studies in school: Wolfe mounted an attack from the cliffs, and a battle was fought on the Plains of Abraham with Montreal falling to the British in 1760. Wolfe and Montcalm both died in battle. When the smoke cleared, the debate started over who actually won the war. It would appear eventually that it was the British. Considering the ages of Jacques Côté and the rest of his family and their location, it's unlikely that anyone in this branch was involved in the actual fighting. But there is no question that they were just across the river, at best, only a few miles away. The Plains of Abraham were originally the property of their great-great-great-grandfather. In 1763, as a result of losing the war, Louis XV of France had the option to keep Canada or regain the French Caribbean islands taken by the British four years before (including Guadeloupe and Martinique and the other minor islands of the French Antilles). His decision was written into the Treaty of Paris, and from that time forward, Canada, excepting the islands of St. Pierre and Miquelon that were kept by France to provide a settlement for fishermen from old France, became a property of the British Commonwealth. Aside from climate, Canada and its potential wealth was less desirable to Louis XV than a few scantily inhabited Caribbean islands. One perhaps wonders about his sanity. The French regime was officially over. The largest and longest period of French emigration to the New World ended. The relationship between France and Québec would be forever tarnished, possibly even severed. Earlier ineptitude, neglect, and insufficient support could be forgiven. For anyone who ever wondered why French Canada seemed to have congenital animosity to old France, being squandered for a few Caribbean islands might have had something to do with it. In 1764, British general James Murray was appointed to transform the colony, unbelievably, into an English colony. Since he had 1,500 soldiers and there were 70,000 French Canadians, he realized that a takeover similar to that in Nova Scotia might not be easy and could cause yet another revolution. He decided against it. By 1766 Murray hadn't produced the results expected, and he was replaced by Sir Guy Carleton. On looking over the situation, Carleton decided that Murray's actions were reasonable, and he proposed that French Canada be allowed to have its own language, church, justice system, and so on. While Britain contemplated this, the Boston Tea Party (1773) and the American War of Independence separated United States from England. 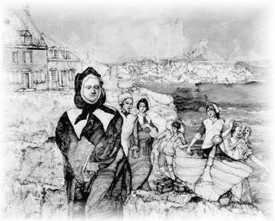 40,000 loyalists fled to Canada from the American colonies thus starting the English-speaking settlements of New Brunswick and Western Québec (later Ontario). In 1774 the British, pressured by their problems in the US and remembering the debacle in the takeover of Nova Scotia, passed the Québec Act which recognized territorial French legal codes and land-tenure system and granted legal status to the Roman Catholic church. Clearly their takeover of Québec would go a lot differently than that of Nova Scotia or of the American states. In 1783, the American Revolution created a border between Canada and the US to the Great Lakes. The French Revolution, starting in 1789 and ending with the beheading of King Louis XVI and Marie Antoinette in 1793, ended the French royal dynasties with an invention created and named for Dr. Guillotine. France was weakened and bankrupt, and its troubles were really just beginning. England declared war again over the king's beheading, and the next generation would experience Robespierre and Napoleon. In the wake of all this, France would never again be a world power. Jean Baptist, 1792 - ? Flavie, 1798-1868 Francois, 1800 - ? Cecile Angele, 1807 - ? No official record is yet found of their birth dates, but it appears that they were all born in Ste-Antoine de Tilly, Québec. Apparently widowed, Jean Charles remarried in 1816 to Marie Marotteand had another daughter, Adelaide, from this marriage. In 1803, France, did a land deal called the Louisiana Purchase and sold all lands west of the Mississippi to the Rockies and south of Québec to the Gulf of Mexico for $15 million. Records were not well kept, and there are considerable date conflicts. St-Flavien is about 20 miles south of Ste-Antoine de Tilly. This was another period when many Côtés as well as other French Canadian families migrated to other parts of North America. The area that included the Eastern Townships was cleared and developed to the extent that it is today, and there was little land to be had for this generation. In the 1830s, a serious economic depression together with severe overpopulation in the Eastern Townships created enormous hardships to the point that there were minor revolts and concerns about political upheaval. Most Côtés living today in Maine, Vermont, New York, and even California, emigrated from French-Canadian settlements during this time. From 1815 to 1855, the British actively encouraged British immigration, and one million Britons moved into the Canadian Territories. In the 1840s a potato famine in Ireland created wave after wave of "coffin ships" that is, ships having people and families on board sick with typhus, starving, or dead. Many Irish names in Québec can be traced to this origin. See www.ncf.carleton.ca/~cd200/mac36.html and www.historyplace.com/worldhistory/famine. In approximately 1863, they migrated to Benson in Swift County, Minnesota in the United States without the older boys Honore and Lazare who were 26 and 25 respectively. Today it might seem an unpatriotic gesture to move to the US. But in those years the border seemed fairly insignificant and people often relocated without bureaucratic fuss wherever economic conditions led them. Once there, they had two more children, Alphonse in 1863 and Clarisse in 1864. In this period, two events occurred having great impact in North America: The American Civil War started in 1863; and the British territories, Québec, Ontario, and Nova Scotia accepted confederation which led to the creation of the Dominion of Canada in 1867. In 1870 Louis Riel led the Metis resisting Canada's authority in the west by seizing Fort Garry at Winnipeg and presenting demands for rights for the Metis in the northwest. In 1870 Manitoba became a province based on those demands, and Riel fled to the US. In 1877, Lazare and his family made a journey already made by his parents to Minnesota where they could get homesteading land. For unknown reasons, Lazare and Clarisse made the decision to move on, this time to Olga, North Dakota, where Marie-Louise and Ulric were born in 1891 and 1892 respectively. Finally they settled in Wales, North Dakota where they had their final child, Clarisse, in 1894. Lazare, like his ancestors, was a farmer and labourer, and there was little work or large enough farms in North Dakota. In 1900, upon hearing there were Western Canadian homesteads available, he decided to look further. Having moved too many times before, his wife Clarisse initially stayed in North Dakota. While the 49th parallel was the border, Lazare's Canadian citizenship made it a simple matter when he chose to settle in 1902 near "Alma" Post Office a few miles from present day Forget, Saskatchewan. At $10 each, Lazare and his boys each bought a homestead for a total of seven. Since Clarisse disliked sod houses, they built a log house and essentially started farming in the same way as thousands of others who arrived on the prairies in those times. Lazare died in 1914, Clarisse in 1921, and they were buried at the cemetery in Lampman, Saskatchewan. Louis Thiévin was an excellent carpenter and farmed near Benson. He retired in Benson and died after a struggle with lung cancer at Estevan in 1958. 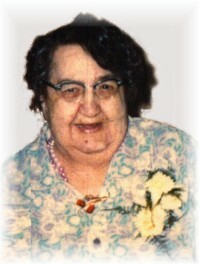 Louise-Marie died in Estevan in 1974. These were two of the nicest of people ever put on the planet. I have several memories. Since Grandma disapproved of alcohol, Grandpa would take guests out to his workshop. There, hidden away, were the libations they sought, and for as long as I remember, he never was without. I also remember Grandma tripping people as they went in and out of the kitchen at the New Year's Day celebration that they always held at their home. Possibly she also liked to drink a bit, but would never, ever let it be known. Both were hard-working and fun-loving people who will always be remembered. Marie-Louise Côté at 17 (1908), the year before her marriage to Louis Thiévin. Louis Thiévin and Côté in-laws: At the centre of this photo is Louis, and immediately below him and to our left is Marie-Louise Côté holding, presumably, their first born, Albert Thiévin. My siblings and I, born in the 1950s and 60s, represent the tenth generation of Jean Côté since his arrival in Canada nearly 400 years ago. By 2003, 14 or more generations that led to our specific family had been propagated. In truth, however, it's possible that other children of Jean Côté propagated even more generations. The long and winding roads that led Jean Côté's other children into the 21st century might well differ, but we will probably never know who they are or what role they play in the Côté mosaic. The research on these pages, of course, focuses only on the Côté descendants who led to my immediate family. There has been a dramatic difference in the rate of proliferation in modern times. Consider this: From 1604 (Jean's birth) to 1891 (Marie-Louise's birth), 287 years and eight generations transpired, averaging 36 years per generation. But grandmother Marie-Louise's offspring produced a whopping five generations between 1913 and 2002, averaging fewer than 18 years per generation — clearly double the rate. Obviously Marie-Louise's offspring bear as much Côté blood as descendants who still bear the name. The first of these, generation 9, are each of her immediate, surviving children, the first two dying from pneumonia on the harsh prairies. She would eventually have 64 grandchildren (generation 10), and 187 great-grandchildren (generation 11), before her death in 1975. Since then, at least three more generations have emerged. My father Aime was among Marie-Louise's many children in the ninth generation. He married Bernadette Dubreuil in 1945, daughter of Francois Dubreuil and Rose Montes. Their children were me (Tom), Richard, Denis, Jim, Charlotte, Francis, Marie, Dianne, Marcel, and Jacqueline. My father served his country in World War II with the Royal Canadian Air Force. He was a wireless operator and flew 28 operations before returning in 1945 to marry Bernadette. He farmed and then ran a garage business in Estevan called Aime's Hillside Service. When his own interest in this waned, he purchased a small resort at Round Lake in the Qu'Appelle Valley called Maple Grove Resort. Both were eventually sold to interests outside the family. Dad was an excellent hunter and trapper, a farmer, mechanic, and businessman. He liked to think of himself as a jack of all trades and master of none, but he was clearly made of survival instincts handed down to him by parents who taught their children to take nothing for granted. Tanguay (a French Compendium of French Canadian Settlers) mentions three or four different Côtés coming from France in the 1700 and 1800 centuries. Jean, or Jehan as he was known, was the earliest of all. He was the ancestor of the majority, if not of all the Côtés whose roots in North America go back three centuries and more. Jean had been dead several years when Abraham Côté (or Botte) dit Soraká arrived from Dieppe. 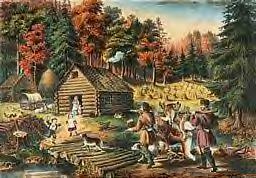 Abraham was married at the Mountain Indian Mission at Montreal on 14 October 1750 to the Onondaga Marie Aéndea. This man, who may not even have been a Côté (it might have been a dit name) since his children were baptized under the name of Bote or Soraká, left no known descendants apart from his own offspring. It is possible that they assimilated into the aboriginal culture and lost their real name. In the following century other Côtés appeared: Claude, a native of Lyon, married Françoise-Angélique Pampalon in Québec on 20 July 1724 and remarried there on 20 June 1728 to Marie-Genevieve Baudouin. He had at least 13 children; two of his sons had wives. Finally, there is another Jean Côté, this one from Languedoc, who probably arrived at the end of the French regime. This Jean married Marie-Francoise Lefebvre at Saint-Constant on 6 June 1768. In fact, the Côté name had the potential to have also been a dit name. For example, it would have been possible in French Canada to have the name added to the original name if that person in some way had a characteristic that led to an intuitive meaning. Thus Jean Doe could have become Jean Doe dit Côté since Côté means 'side' or 'coast' (as in coastline) if he lived beside something significant such as the St. Lawrence or the Bay of Fundy. To take this supposition further, eventually the Côté name might have stuck and a land title or church record might have simply listed him as Jean Côté, leaving out the real name entirely. This process happened often and is the kind of thing that makes careful genealogical study necessary. Many of our relatives have wondered about the possibility of aboriginal blood and how much of it might run in our veins. This is not an easy question to explore, and the answer might never be known. There's much to ponder: In terms of lineage, it appears there is no formal, documented intermarriage with non- French-Canadian Europeans throughout our branch of Côtés (emphasis on our branch). Granted, this depends on documents that genealogists often consider less than ideal data sources. Since our branch of Côtés were essentially farmers and land settlers, not soldiers, trappers, or traders, their exposure to Natives was considerably less than for other occupations after the first generations. And since our branch lived in eastern townships south of the St. Lawrence River, they were quite apart from interactivity with the Iroquois in early years on the north side of the river. There certainly are Côté family branches in Québec with well-documented marriages to non-European or Natives. I have a friend whose name is Côté, a piano tuner in Ottawa, who insists that his great-great-great grandfather who fought in the War of 1812 was part of a large-scale mass marriage that occurred at the conclusion of that war where soldiers of both French and British ancestry took Native brides. While I haven't found documentation to support this, there are other documented Côté marriages to non-Europeans. I met a man in Edmonton in January 2002 wearing a jacket with the embroidered words "Cote First Nation". Given my knowledge of a Cote reservation in Saskatchewan, I approached him and learned that he was newly elected Chief White Hawk. I regret that I didn't note his proper Ojibwan name. Regarding the naming of Cote First Nations, he said — and I hope I have this right — that Cote was one of the negotiators of the treaties and that naming was often done that way since many bands had no formal name. The liaison in this case was Gabriel Côté whose name became that of the band's. On checking further, I found Côté was a chief, probably a Metis, who also represented two other bands in the area that signed Treaty 4, although White Hawk's tribe might not have actually signed or authorized Côté to represent them. While there is an obvious issue over enforcement of their rights, the band has lived under the terms of Treaty 4 since 1870. To save the Ojibwa language from extinction, Chief White Hawk is promoting its use in schools, although he does not speak it himself (as an attestation to his cause). He is also involved in litigation with the federal government for regaining treaty land reclaimed since the signing of Treaty 4. I found all of this interesting but evidence that the Cote First Nations has very little, if any, connection to our own Côté lineage. It might be that Native children were adopted and absorbed into earlier Côté families. Again, this is virtually impossible to prove since adoption, as practised in those days, usually terminated any connection with a biological family. Since most births occurred in the home using midwives, records are scant, if any, on both European and Native sides. Usually the first personal record to exist was a baptismal record or a mention in church records kept at the time. Most interesting in our branch are the facts surrounding our ancestor Jean Charles, specified above in the fourth generation, born in 1767. Given his mother was 45 and father 59, that they had been married for 11 years, and that there already were nine children from a previous wife, this clearly is a situation with limitless possibilities and no facts to support any conclusion. In Jean Charles' case, we're left to accept that he was most likely biologically related to his mother and father. But if he was adopted, there are several possibilities: His adoptive parents might have actually been his grandparents. Possibly his biological parents were an uncle/aunt or cousins who were not able to care for him. Possibly he was not related by blood but still of French European blood. And possibly too, he might have been an orphaned Native or even a Metis boy related to the family. But without any information, we can only assume at best that his biological parents raised him, unless new evidence arises. It is intriguing that of the many internet genealogical record sites for this family, only one lists Jean Charles as son of Jean Baptist and Charlotte Houde. For as long as I can remember, my Côté family always had a place at the table for anyone and everyone. It was a long-standing, humble family tradition, undoubtedly passed down through numerous generations. Almost certainly our ancestors would have advocated that taking someone in was the right thing to do, no matter what the circumstance. Alberta has claim to a rather famous Côté. He was Jean Léon Côté who was born at Les Éboulements in Charlevoix county in Québec. J.L, as he was called, was educated at Ottawa College (now the University of Ottawa) and learned surveying at l'Académie Commerciale. He came west in 1886, working for the Dominion Land Survey (D.L.S.) and then in private practice. This was a time when most important surverying projects in Western Canadian history occurred. Besides involvement in the Alaska-Canadian Boundary, and the Klondke Gold Rush, he worked considerably in Manitoba and Saskatchewan, around Edmonton and on the emerging rail lines in the area. In 1909 he was elected to the Alberta Legislature as a Liberal member from Athabaska, and in 1918 he became Minister of Mines and of Railways and Telephones. In 1923 he was appointed to the Senate by Hon. MacKenzie King. He was an active promoter of research and science and became the first chairman of the Scientific and Industrial Research Council, later to become known as the Alberta Research Council. There is a village in Northern Alberta in the Peace River country named after him as well as a Mountain (Mount Cóté) near Jasper Park. The Côté lineage is truly a study of one of Canada's, and for that matter, North America's longest standing family legacies. A Côté member has ancestry that witnessed Canada's development from the earliest days of European settlement right through to the present. Additionally, the remarkable expansion of this family has probably placed descendants of Jean and Anne in every province in Canada and every state in the US. 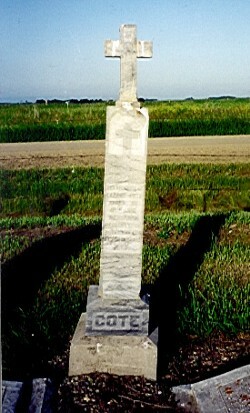 Lampman, Saskatchewan: Resting place of Lazare Côté and Clarisse Bergeron Côté, parents of Marie-Louise Côté (below), wife of Louis Thiévin, A1 B7. For a brief history of this family, read the A1 Family Tree info and the A1 chronicals. While our branch of the Côtés has concentrated on agricultural pursuits, other branches of the Côté family have engaged in every imaginable trade in their time. And while most of our branch of the family remained within a 20-mile radius in Lotbiniére Township in the Eastern Townships of Québec for about 200 years, other branches have moved or transplanted themselves many times within any given generation. It's also interesting that since members within our branch were never the oldest or the oldest male, there was never a transfer of the homestead property in this branch. At the same time, five generations were born in an area of about 20 miles in Lotbiniere municipality and each generation must have set about clearing land for their farms. According the Canadian Veterans affairs, 40 Canadian Côtés died in the past two world wars. Four American Côtés were killed in the Vietnam War. Finally, I have but one regret. I think my father would have been fascinated by this information. He was interested in genealogy and worked a lot on Thiévin, Dubreuil, and even Montes (my mother's side) family trees. It is completely possible that some of his buddies in the RCAF Alouette Squadron in World War II were distant cousins, and he would never have known. The Côté family is one of Canada's original families and their contribution to Canada and North America is immense. And it all started with Jean and Anne, a slow boat, and a work contract. This would not have been possible without the work of many who have gone before, collecting data and searching out long-forgotten documents. I am especially thankful to David Côté of High River, Alberta who provided much of the genealogical basics needed. From there I was able to find other sources that verified David's data. The internet proved to be a huge asset. All data provided by David Côté was further substantiated there. The Richard Côté database proved to be the most complete. I also greatly appreciate the work of Esther Dube and Denis Thiévin. There is a great history site dealing with Metis and other Canadian history at www.agt.net/public/dgarneau/. Our first Cote ancestor was Jean Jehan Cote whose roots in North America go back over three centuries. Jean Cote presumably came from Mortagne, Perche, France. He was recruited by Robert Giffard (the first lord of Beauport) in 1634 with the fleet "Le St-Jean" of Duplessis-Bouchart and Capt. Pierre de Nesle. He arrived in Québec after a voyage of approximately two months of around 75 persons; among them Robert Giffard - medicine man, architect Pierre Clust, surgeon Simon Baron, master Jean Coste, Robert LeCorq, Jean Bourdon and Marin Boucher and his family. Payment of voyage to be paid at Québec in beaver skins was 9 "livres pesant" or French pound, 50 "livres pesant" to return to France, and 30 "livres pesant" to return to Canada. Jean worked for Charles Huault de Montmagny in Québec, who became governor after Champlain's death in December 1635. He married Anne Martin on November 11, 1635 at Québec by Father Charles Lelemant, a Jesuit priest, and witnessed by Guillaume Couillard and Robert Giffard. His was one of the first families to settle on Ile d'Orleans of present St. Pierre parish. He first settled at Québec, where he owned a house on the corner of rue Tresor and rue Baude on land 150 ft. frontage by 60 ft. in depth next to the Notre Dame-de Roucouvrance Church. He offered this land as dowry to daughter Simone when she married in 1649. The house had a value of 450 livres but the newlyweds paid 300 livres and the balance of 150 livres as their wedding gift. He also owned land between "la Grande-Allee" and the St. Lawrence River of one acre frontage and depth to the St. Lawrence River — total 6 acres — then on the outskirts of Québec which he received on August 27, 1636 from Governor Montmagny and ratified on April 5, 1639. This was sold to Antoine Leboesme dit Lalime on 8-11-1652 for 300 livres which Jean bought merchandise for at the store "Compagnie des Habitants". (Ct. Vachon) 12-24-1652, he confirmed his title deeds along with Robert Giffard in Beauport. On 2-3-1653 (Ct. Audouard) settled his debt of 30 livres from son-in-law-Pierre Soumande and also the same sum to Louis Le Sage. On July 21, 1641 "La Compagnie de Nouvelle France" gave Jean and associate Noel Langlois compensation for work done at "Seigneurie de Beauport"; the arrangements with Robert Giffard. He sold 500 boots of peasant wheat (16-18 lbs.) valued at 80 pounds, for which he bought a horse and cows. In 1642, Jean obtained permission from Robert Giffard to graze his animals on the Beauport prairies for three years. He worked for Robert Giffard in return for working one day a year per animal not counting the yearlings. In turn, he would gather hay for lodging of cattle. On February 5, 1645 he finally received a concession on the banks of fleuve for three acres of frontage #126 in Beauport on the St. Lawrence River, surveyed lot #342-350 and to the depth of the Seigneury of Beauport between the lands of Zacharie Cloutier and Noel Langlois, who feared the Iroquois. Noel Langlois donated a small portion of his land next door to his homestead for Jean to build his home there. Rent of five sols per year due was cleared by Noel Langlois on 6-7-1681 for all of Jean's unpaid rent. In 1652 he obtained a parcel of land of five acres, 79 perches x 10 acres depth "au bourg" Du Fargy near Beauport River and north of the church. Because of Iroquois hostilities, Jean left Beauport and returned to Ile d'Orleans. Upon Jean's death none of his sons were married. Jean died at his home in 1661 and is buried in the church of Notre Dame de Québec. Note: While I credit Linda for providing these details, I have seen many of them elsewhere. I should also mention that some of the information is debated. Still, her research is generously provided, with thanks, and I hope that others would agree that the mission to discover secrets of our Côté past will probably never end. Costé (Côté): Original family from Caux, Normandy which owned lands and fiefdoms ever since Saint-Louis. The proof can be seen in the letters of assignment which were issued by that prince, dated July 1259, by which his Fief of Senneville is attached with certain conditions, the original of which was communicated by Pierre Côté, Knight, Seigneur of Friqueville, eldest of the branch of the family bearing his name, proprietor of that same fief which was given to him during the sharing of the separation of the family branches, and was always in the family, without interruption, since Saint Louis. This is confirmed by all the registries of the counts of Normandy and on the epitaph of Jean Côté, Seigneur d'Harfleur, who lies buried in the parish of Senneville where he died in 1535. This family was known in this province even before the time of St. Louis. We need only to consult history in which we see the name of Hugues Côté in the lists and enumerations of the knights and seigneurs who went overseas with Richard, known as the Lion Heart, Duke of Normandy and King of England. The lands of Saint-Supplix, Buglise, and St. Barthélemy became property of the Côté family through Jeanne de Normant, daughter of Jean le Normant, seigneur of the said lands, who married Pierre Côté, seigneur of Harfleur, of Ridelieu and of Nonneville. Pierre Côté died in 1577, member of the chamber of counts of Normandy and counsellor to the state. The seigneurie of Saint-Supplix was created in Châtellenie in favour of Pierre Côté, second of that name, grandson of the first Pierre Côté. He died a member of the chamber of counts of Normandy, state and private counsellor and a commissar of the court for reformation of the customs in that province. Alexandre Côté Marquis of Saint-Supplix, counsellor to the parliament of Normandy, married Marguerite Blais, baroness of Crepon, Dame de Vaux, Grais and other areas. She was a goddaughter of King Louis XIV and daughter of Jean de Blais. Of that marriage were born: Alexandre Côté, Marquis of Saint-Supplix, Baron of Crepon, seigneur and governor of the cities of Harfleur, Buglise, St. Barthélemy, Ecrepentor, Vaux, Grais, Bavon, Quesnay, Cambres, Sainte-Croix-sur-mer and others. 1. Alexandre-Antoine-Sébastien, Marquis of Saint-Supplix, officer of the king's regiment, infantry and aide-de-camps to the late Count of Clermont, Blood Prince. 2. Pierre-Jacques-Alexanndre, count of Saint-Supplix, officer in the same king's regiment, and later captain in that of Bonac. 3. Marguerite-Angélique, married September 14, 1746 to Noël-Florimond Huchet de la Bédoyère.